Why Wind Power for North Carolina? One of the biggest issues in the world today is our reliance of non-renewable energy resources. The United States has made increasing efforts to denounce its dependency on foreign oil and create new sources of alternative energy. The largest contributor to global warming has been the burning of coal to mass produce energy. The United States produces nearly 50% of all its energy from coal. In the U.S., buildings account 70% of all electricity consumption, 39% of energy use, 40% of raw materials use, 30% of waste output (136 million tons annually), and 12% of potable water consumption. Recent laws passed by North Carolina legislature requires at least 20% of all our energy needs comes from renewable resources. In result, new developments in construction technology are emerging stronger than ever. Wind power is affordable, clean and sustainable, and it provides jobs and other sources of income. With an average annual growth rate of more than 30 percent over the past half-decade, wind is the fastest-growing sector of the energy industry in the United States. The advantages of wind energy are numerous and clear, and the technology itself has taken a leap forward in recent years. We must make special efforts to encourage this development today to ensure that renewable energy technologies become a significant part of our energy future. Western North Carolinians are favorably disposed toward the development of a wind energy industry in the Appalachian Mountains. They want more of their future electricity derived from renewable sources and less from fossil fuels. By over 2 to 1, western North Carolinians do not believe that ridge top turbines should be prohibited. Support for ridge top placement is not systematically affected by experience with seeing a modern turbine in operation, awareness of energy issues, income, or education. Wind Power Creates Jobs. Wind energy provides more jobs per dollar invested than any other energy technology. Every time a wind energy project is installed, it creates new jobs for people who set up and maintain the turbines. Employment opportunities range from meteorologists and surveyors to structural engineers, assembly workers, and mechanics and operators. The U.S. wind industry currently directly employs more than 2,000 people, and every megawatt of new wind capacity creates 15-19 jobs and about 60 person-years of employment. Example: The Wisconsin Energy Bureau estimates that wind projects create three times as many jobs as the same level of spending on fossil fuels. Conversely, Portland General Electric estimates that a 240 MW natural gas plant drains $28-55 million out of the regional economy annually for fuel imports. 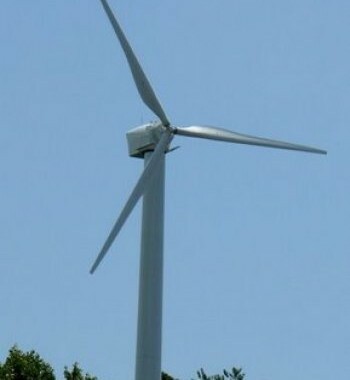 Wind Power Reduces Air Pollution. In the Southeast, the air pollution that results from fossil fuel powered electricity generation threatens human health, the environment, and the long-term economic viability of this region. Electricity generation is responsible for 76% of the SO2 emissions in the Southeast, almost a third of the oxides of nitrogen and mercury, and half of the carbon dioxide. Investing in wind energy can reduce the harmful effects of air pollution from fossil fuel fired power plants. Wind energy can provide us with cleaner air and a healthier, safer environment. Wind Power is Cost Effective. In the last century, coal, oil, and natural gas were promoted as cheap sources of energy, but their hidden costs have been enormous. Wind power has no hidden costs, and it has become more cost-effective with each new round of technological advancements. The cost of wind-generated electricity has fallen from nearly 40½ per kWh in the early 1980s to 3-10% kWh today depending on wind speed and project size. Since wind is free, the price of wind power is stable, unlike electricity from fossil fuel powered sources which depends on fuels whose prices are costly and may vary considerably. Wind Power Supports our Economy. Since North Carolina has no indigenous fossil fuel reserves, we must import all of the fossil fuels used to generate electricity in the state. Increasing the role of wind power in North Carolina's energy mix puts us in a strong position to withstand fossil fuel price increases in the future, puts our energy dollars back into our economy, and powers the economy without causing pollution, generating hazardous wastes, or depleting natural resources. Wind Power can help meet North Carolinaï¿½s Energy Needs. According to the Office of Energy Efficiency and Renewable Energy, North Carolina has the capacity to produce 8 million MWh of wind energy. This amount of electricity would account for 8% of our state's electricity consumption. Wind Power Develops Rural Economies. Wind energy can diversify the economies of rural communities, adding to the tax base and providing new types of income. Wind turbines can add a new source of property value in rural areas that have a hard time attracting new industry. Example: Each 100 MW of wind development in southwest Minnesota has generated about $1 million per year in property tax revenue and about $250,000 per year in direct lease payments to landowners. Ranchers in west Texas are welcoming the revenue from wind projects to replace declining royalty payments from soon-to-be-depleted oil wells. In addition, building wind power projects can help contribute to a stronger infrastructure of roads and power lines. Wind Power Is Sustainable. Wind energy is a technology we can sustain over the long term. It won't pollute our air and water, and it won't produce wastes that will pile up year after year. It's also renewable. We can continue to use wind power effectively and efficiently for centuries, without worrying about how it will affect future generations. Wind Power Reduces Global Warming. Global climate change is an increasing concern of the scientific community and governments around the world, and it is a reality we must begin to address. Carbon dioxide released from fossil fuel combustion is one of the primary heat trapping gases that contribute to global warming. Wind energy produces no byproducts that contribute to global warming, and the power from single utility-scale wind turbine can prevent the emission of 5,000 tons of carbon dioxide (CO2) into the atmosphere each year. Wind energy is one of the most useful tools we have to decrease the global warming gases we release into the atmosphere every day. Example: A study conducted by energy experts from Stanford's Department of Civil and Environmental Engineering has concluded that, by building approximately 250,000 new turbines, America could eliminate almost two-thirds of its coal-generated electricity. This would reduce US 1999 greenhouse gas emissions to 7 percent below 1990 levels -- a goal originally proposed by the Clinton administration under the controversial 1997 U.N. Kyoto Protocol on climate change. Mountain Construction is a full service custom builder offering Log, Timber Frame, Structural Insulated Panels nationally as well as local New Construction of any type and Remodeling and Restoration services. We are NAHB Certified Green Professionals. To find out how we can help you build or remodel your home CONTACT US.